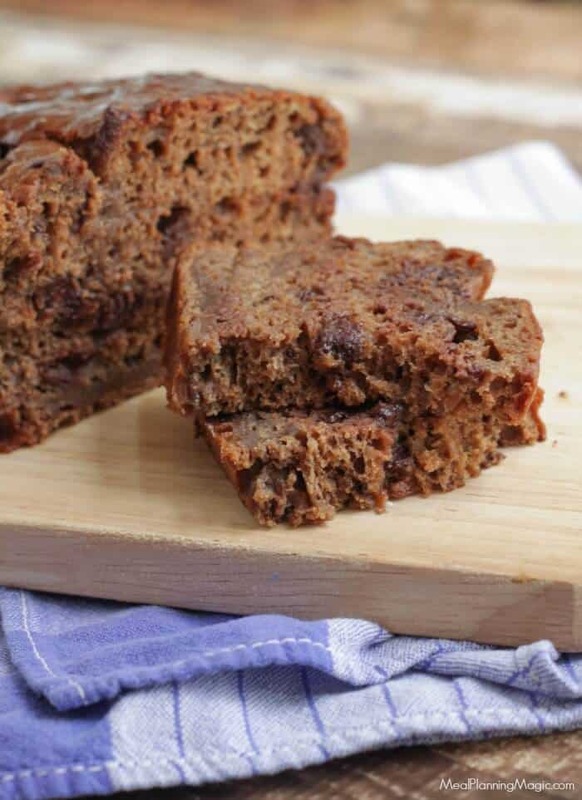 You’ll love this Healthier Decadent Double Chocolate Banana Bread. 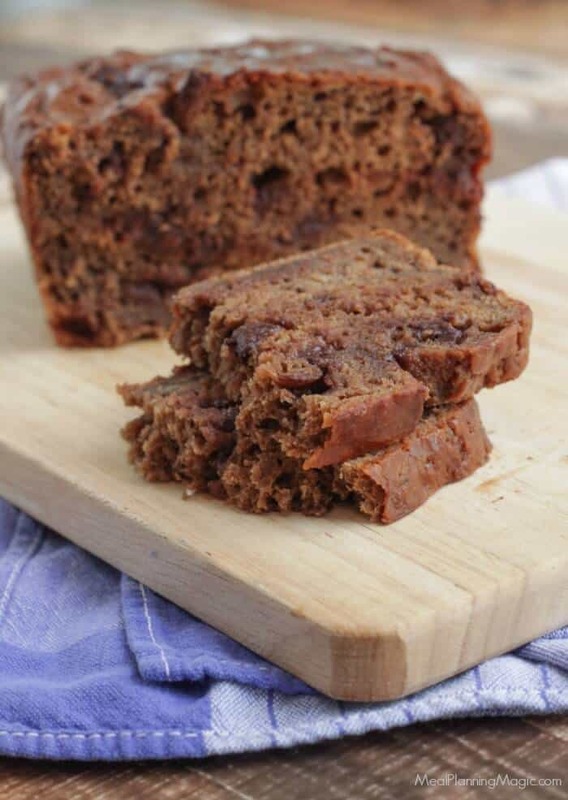 It’s so moist and delicious and has been made healthier from it’s original recipe. So, I mentioned before when I made the Spanish Rice and Beef Skillet Dinner that I’ve been going through lots of my older “church or club” cookbooks trying out recipes I’ve had marked for ages. The thing is, so many of these recipes are not always the healthiest. 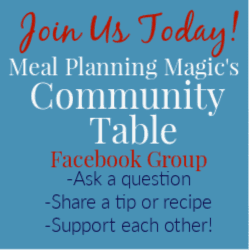 True, the recipes are in those cookbooks because they are generally family favorites but sometimes they are full of extra ingredients that maybe aren’t so great for you. Mainly meaning, they might call for a whole lot of one ingredient (say butter or margarine). So as I’ve been going through and trying out the recipes, I’ve also been tweaking them a bit to make them healthier. In this recipe for Double Chocolate Banana Bread, I decreased the amount of refined sugars, decreased the amount of chocolate chips and substituted plain Greek yogurt for the butter. I first made it as written and my family gobbled it up! But later, when I made those changes, my family still loved the bread just as much and I ended up making it three times in one week! 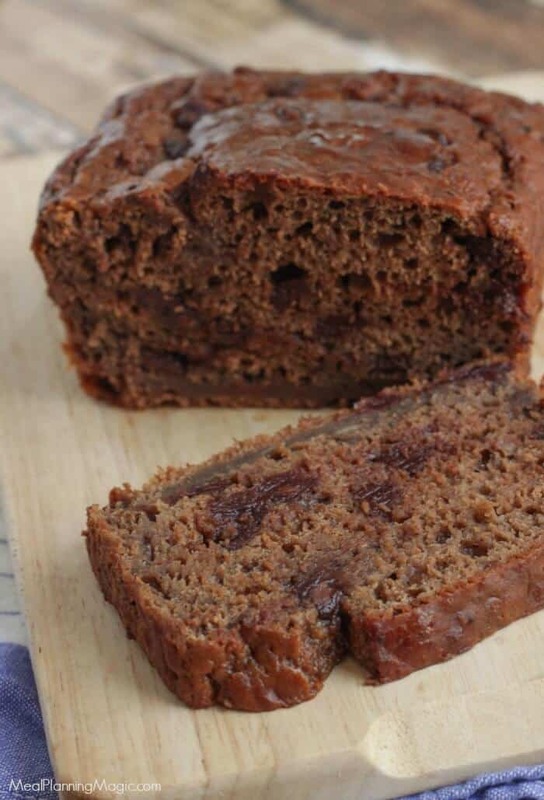 I don’t know what it is about chocolate and bananas but wow—this Double Chocolate Banana Bread is SO yummy! 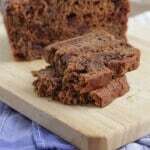 It is moist and chocolatey and just enough sweet that you can enjoy a slice anytime! We had it for breakfast with some scrambled eggs sometimes but also as an afternoon snack in the summer. We just couldn’t get enough of it! Like my Whole Wheat Banana Bread, this recipe is a great way to use up those bananas that are likely getting ripe on your counter. It seems I always have a couple of those week-to-week. I hope you’ll give this recipe a try and let me know what you think. It’s definitely become a family favorite here and part of our regular recipe rotation! Preheat oven to 350°F. Grease 9x5 loaf baking pan. Set aside. In a large bowl, combine flour, cocoa, sugars, baking powder, baking soda and salt. Set aside. In a blender or food processor, puree bananas to measure 1 ½ cups. In a small bowl, combine puree, yogurt, eggs and vanilla. Add puree mixture to dry mixture. Bake for 60-65 minutes. Bread is done when toothpick inserted in center comes out clean. Place bread in pan on baking cooling rack and cool for 5 minutes in pan. Then remove bread from pan onto cooling rack and cool completely.